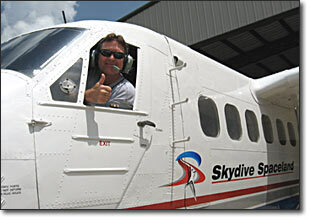 Skydive Spaceland is located on a private 134-acre airpark built for skydiving operations 25 minutes south of Reliant Stadium in Houston, off of State Highway 288 in Rosharon. Get directions below. Do you need help getting to Spaceland? We do not have a shuttle service, but you can usually get out here easily with Uber or Yellow Cab: (713) 236-1111. **Listen for parachute activity on 123.15 MHz.